Peaches have been grown in Asia for more than two thousand years, and produced for centuries in the United States. Peaches are considered the “Queen” of the fruits and second only to apples in popularity as a deciduous tree fruit because of their fine flavor and many uses as a fruit. Figure 1. Tree-ripe peaches can be juicy and tasty rewards to hardworking gardeners. Photo by Keith Weller, USDA. Nectarines can be used in the same way as peaches, and may be considered as substitutes for peaches. Genetically, the only difference between peaches and nectarines is the lack of fuzz on the nectarine skin. Usually, nectarines are smaller than peaches, have more red color on the surface and more aroma. Popular uses for peaches and nectarines include fresh eating, sugared and with cream. They are also used in ice cream, pies, cobbler and shortcake. In addition, peaches and nectarines are used for jam, jelly, preserves and mixed fruit desserts. Fresh peaches provide respectable amounts of the antioxidant vitamins A and C in addition to potassium and fiber. Nectarines provide twice the vitamin A, slightly more vitamin C, and much more potassium than peaches. There are hundreds of different peach cultivars (varieties), but basically there are two types: freestones and clingstones. In freestone types, the flesh separates readily from the pit. In the clingstone type, the flesh clings tightly to the pit. The flesh may be either yellow or white. Freestone types are usually preferred for eating fresh or for freezing, while clingstone types are used primarily for canning. Nectarines may be either yellow or white-fleshed. High quality peaches and nectarines are firm and free from defects such as bruising, and insect and disease damage. The best ripe peaches and nectarines have a deep yellow or creamy white color rather than those that are pale or dark green. Color varies according to cultivar. Green color indicates immaturity. Peaches and nectarines harvested when too green may shrivel or fail to develop a desirable flavor upon ripening. The red blush makes the fruit attractive but may not be helpful in determining fruit maturity. Peaches and nectarines that cannot be consumed or processed immediately should be stored at temperatures as near 32 degrees Fahrenheit as possible and in a high-humidity atmosphere to preserve quality. In many cases, the home refrigerator comes closest to meeting these storage conditions. It is best to use or process the fruit as quickly as possible since it is highly perishable under high temperatures and not well suited to prolonged cold storage (more than 14 days). Should I Grow Peaches and Nectarines in My Home Garden? Nothing compares to the taste of tree-ripe peaches or nectarines. Homeowners with available land may consider establishing a backyard fruit planting. Such a planting can be quite satisfactory if the fruit grower is aware of what it takes to grow high-quality peaches. Peach trees are subject to some serious insect pests and diseases. Frequently, the season’s crop may be lost either by flower bud kill due to low winter temperatures or to bloom kill by late-spring frosts. The best chances for success in growing peaches in the home landscape result from selecting bud-hardy cultivars, protecting the bloom from late-spring frosts, and managing insects and diseases. Those unable or unwilling to do these things should not attempt to grow the fruit, since the results will be disappointing. Regardless of whether the consumer is selecting peaches for consumption or nursery stock for planting, the choice of cultivar is most important. Because of past experience with crop loss due to winter bud kill, peach and nectarine cultivars are being carefully screened for bud hardiness and fruit quality before being recommended to growers. Refer to Table 1 for peach and nectarine cultivars suggested for Ohio gardens. Redhaven has been the most reliable cropping peach in Ohio and other cultivars can be tried to lengthen the harvest season. Peach and nectarine cultivars do not require cross pollination and set satisfactory crops with their own pollen. A single peach or nectarine tree can, therefore, be expected to bear crops in the home landscape if flower buds or flowers are not killed by low temperatures. However, three to four trees of different cultivars will extend the season and might be more desirable for an average family. Desirable nursery stock for planting consists preferably of one-year-old trees, 3 to 4 feet in height with good root system and a trunk caliper of 3/8 to 1/2 inch. Nursery stock of this type can be more easily transplanted and trained into a desirable tree form. Refer to the websites of common mail-order nurseries for available cultivars. Many local garden centers carry bare rooted and container-grown fruit trees. Both bare rooted and container grown fruit trees transplant well. Peaches or nectarines require full sunlight and should not receive shade from buildings or tall trees. If possible, select a site with a high elevation so that cold air can drain away from the tree on a cold night during bloom. The best site will have well-drained sandy loam type soil. Peach or nectarine tree roots or rootstocks will not tolerate soils where water remains on or near the surface for more than one hour after a heavy rain. Prepare the soil one to two years before planting so that soil pH, organic matter and nutrient status can be modified for the production of high quality peaches and/or nectarines. Prepare a bed at least 5 to 6 feet in diameter by cultivating (spading) 10 to 12 inches deep and adding organic matter such as manure, leaves, grass clippings and compost. Take a soil sample, have the soil tested by your local Extension office, and add the recommended lime and fertilizer. For best results, sample soils 6- to 8-inches deep every two to three years. Plant your tree in the spring in the center of your prepared area. For grafted trees, keep the bud union 2 inches above the soil. Planting a peach or nectarine tree too deep in the soil can cause poor growth or death. Table 1. Suggested peach and nectarine cultivars for Ohio gardens. The open center system is recommended for peach and nectarine trees for maximum sunlight exposure, maximum yield and best quality (Figure 2). Pruning and training should be done in the year of planting and every year after to develop a strong, well balanced framework of scaffolds (a tree with a strong trunk and well positioned side branches); and to maintain the balance between vegetative growth and fruit production. Figure 2. Open center or vase system recommended for peach and nectarine trees. 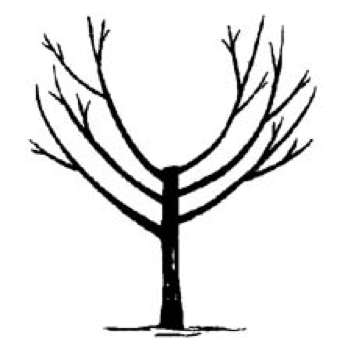 Immediately after planting, prune the tree back to a height of 26 to 30 inches. Cut off all side branches to leave a whip (a shoot without lateral branches or with lateral branches removed) that is 26 to 30 inches tall. This sounds drastic; however, the best shaped open center trees come from those pruned initially to a whip. During the first year, remove diseased, broken and low-hanging limbs. Then remove vigorous upright shoots that may have developed on the inside of the main scaffolds and if left could shade the center. During the second and third years, remove low-hanging, broken and/or diseased limbs. To maintain the open vase, remove any vigorous upright shoots developing on the inside of the tree, leaving the smaller shoots for fruit production. Finally, prune the vigorous upright limbs on the scaffolds by cutting them back to an outward growing shoot. The principles used to develop the trees are used to annually maintain the size and shape of the mature tree. Remove low-hanging, broken and dead limbs first. Next, remove the vigorous upright shoots along the scaffolds. Lower the tree to the desired height by pruning the scaffolds to an outward growing shoot at the desired height. In years without frost and freeze damage, more peaches will set than the tree can support and fruit must be thinned. Approximately three to four weeks after bloom, or when the largest fruit are as large as a quarter, fruits should be removed by hand so that the remaining peaches are spaced about every 8 inches. Fruit thinning will allow the remaining fruits to develop optimum size, shape and color, and prevent depletion of the tree. Apply a ½ pound of 10-10-10 fertilizer or its equivalent seven to 10 days after planting and the same amount again 40 days after planting. Broadcast the fertilizer evenly, 8 to 12 inches away from the trunk. In the second and third years after planting, the tree should receive ¾ pound of 10-10-10 in March and again in May. 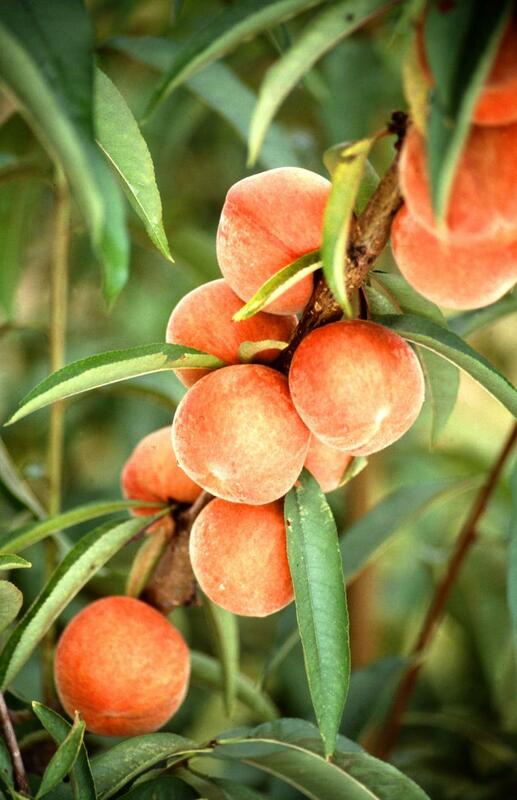 Mature peach trees (4 to 10 years of age) should receive 1 to 2 pounds of 10-10-10 fertilizer each in March and May. If the tree is vigorous and there is no fruit expected, only the March application is necessary. Broadcast the fertilizer around the outer edge of the tree keeping the trunk area free of fertilizer. Peach trees need to grow 18 inches of new growth each year. Remove the sod from under the tree, and mulch and/or irrigate as needed. Irrigation will increase yield particularly if it is applied three weeks before harvest. It is very difficult to grow peaches or nectarines in the home garden without an effective pest control program. Common insects and mites affecting peaches and nectarines include tarnished plant bug, stink bug, oriental fruit moth, plum curculio, peach tree borers, Japanese beetle, green June beetle and European red mite. Common peach and nectarine diseases are peach leaf curl, brown rot and scab, bacterial spot and powdery mildew. Refer to OSU Extension Bulletin 780, Controlling Disease and Insects in Home Fruit Plantings and other fact sheets for more information. Home fruit growers are also encouraged to purchase a copy of the OSU Extension Bulletin 940, Midwest Home Fruit Production Guide, for more information. Ellis, M, and C. Welty. 2010. OSU Extension Bulletin 780, “Controlling Disease and Insects in Home Fruit Plantings.” Columbus, OH: The Ohio State University. Gao, G., R. Becker, M. Brown, M. Ellis, S. Prochaska, C. Welty, and R. Williams. 2017. Ohio State University Extension Bulletin 940, “Midwest Home Fruit Production Guide.” Columbus, OH: The Ohio State University. Whealy, K., and S. Demuth. 1993. “Fruit, Berry and Nut Inventory” published by Seed Savers Publications, Decorah, Iowa. Phone: (319) 382-5990.